Two pictures of my study, at least a part of it. Which is that Holy Actor? Paresh: Thanks Paresh. It is “Bharath Murali Holy Actor” published by Olive Publications. It is the collection of essays on Murali by famous personalities. Makes interesting reading. It is in Malayalam. Wow…! Pretty colors …..Pretty good collection too…! 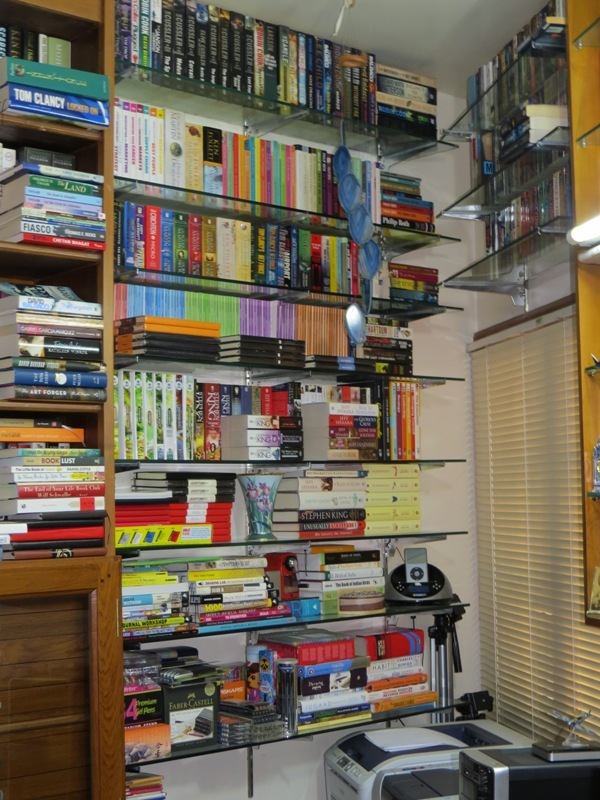 Wow Alexis, great collection; wish I could zoom in and see all the titles! Good to see you back on the blogosphere….it’s been quite a while since you posted, I guess this is the first post for 2013? Do post as often as you can, wishing you a wonderful year ahead. Wow!!!!! Simply amazing! 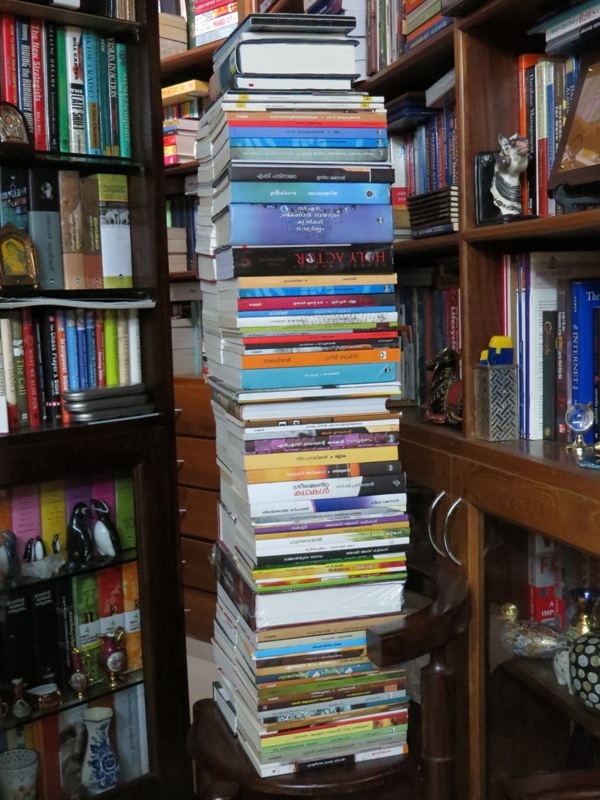 What’s with The Leaning Tower of Books? 🙂 You must post pics of your pen and pencil collection too….would love to see. Paresh: You are welcome. Yes, I read a lot of Malayalam books too. Vandana: Thanks Vandana. Yes the first post of 2013. Very busy with writing and teaching. Jane: Thanks Jane. The tower is due lack of space and also I have to read about 15-20 books in that tower. Even though it is high, it is quite stable. Roji: Thanks Roji. The camera is Canon PowerShot SX50 HS. The symmetry, the alignment, the colours….all beautifully co-ordinated! The books…the books…the books! A small piece of heaven on Earth!!! Bliss! ഈ കൂട്ടുകാരൊക്കെ അലക്സിന്റെ മുറി ഒരിക്കലൊന്നു കണ്ടിരുന്നെങ്കിലോ ! ‘ഇന്ദ്രനീലം കൊണ്ട് മാനത്തു തീര്‍ത്തൊരു ഗന്ധര്‍വ്വ രാജാങ്കണത്തില്‍’ എന്നു കേട്ടിട്ടില്ലേ.. അതുപോലെ മനോഹരമായി അടുക്കിവച്ച നല്ല നല്ല പുസ്തകങ്ങള്‍ കൊണ്ടു ചുവരുകള്‍ തീര്‍ത്ത ഒരു മായാലോകം എന്നല്ലാതെ എന്താ പറയുക ! അലക്സിന് അഭിനന്ദനങ്ങളുടെ ഒരു പൂച്ചെണ്ട്..